Ovi Racing: It’s free but is it worth? So the most talked about game recently has just been made available on the Ovi Store and most of us were actually quite excited about this game. Here’s a brief intro on the game and some of my opinions. It’s basically a top down style racing game with a twist. 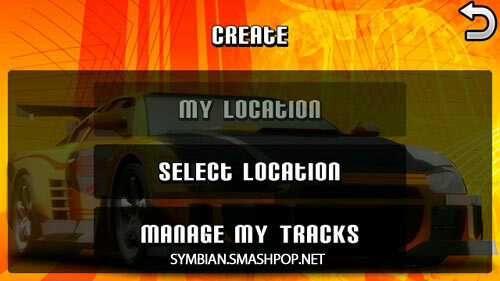 It lets you to race on a track selected by you, either using the predefined ones or your own location by utilsing the GPS to find out where you are and the roads around you. Once you are in, you will have to select online mode or offline. Pick the first one if you want to use your current location as a racing track. In offline mode, you can select a country of your choice, select the starting point from the “animated” map and then start off the race. When I first saw this I was not amazed, as I was expecting to see the real Nokia Ovi maps (thinking that it should be integrated with each other) but all we get is just a simply block and path kinda maps with dots. The gameplay is very simple. No acceleration. No braking. All you can do is just steer left or right by tapping the icons on both sides of the screen. I like how the little car drifts though haha but expect a lot of oversteer and slides…. and do you notice how pixelated the graphic is? I dont understand why is the game so “basic” but anyways its a free game so we cannot complain much. Check out the video I recorded below. 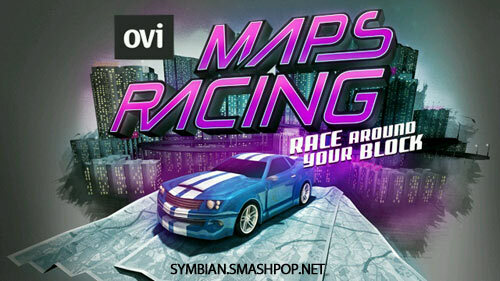 Wanna get Ovi Racing on your phone? Click here now to get it free from the Ovi Store! 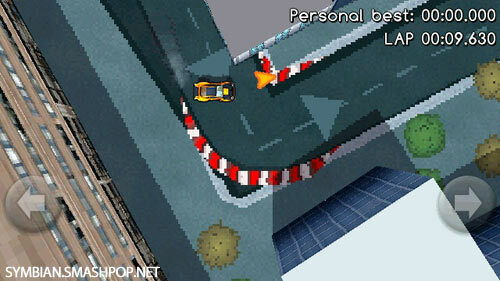 It’s a game based on GPS location, maps and your driving skills. Basically when you launch the game, it will detect your location via GPS and then present you the map of the area you are in and then you can start racing in your neighbourhood. Here are more screenshots of the game. The game will soon be available for download, so for now, enjoy the game trailer first. Layers added to Google Maps Mobile! Google added a new feature to it’s maps application yesterday. It’s called ‘layers’. Imagine stacking a few layers of transparent sheets on your map, each displaying different information. You can activate the layers by clicking on options > layers. It will bring out a menu that lets you select which layer to activate, wikipedia, traffic, transit lines or my maps. Currently traffic and transit lines are not available in Malaysia yet so we can only add the Wikipedia layer. Tapping on the Wikipedia icons brings up an extract of Wiki article about the particular location or landmark. There is also a link the original article on the website. To download Google Maps v3.2, click here. Nokia Friend View updated with friend alerts! As some of you might know or might be already using Nokia Friend View, the beta app has been updated and friend alerts feature has been added to it. Friend View is actually a location and micro-blogging service that helps you stay in touch with your friends and family so you can update one another with what you are doing and where you are doing it. You can actually update your status… what you are doing… how you feel.. who you are meeting.. or simply just post a note and let your friends know where you are using the Friend View app on your phone or the web version of the service. Now you can keep Friend View in the background in “Normal” or “Active” modes (options: Refresh Mode) and a “pling-plung” from Friend View will tell you that your friend is close by so you can meet. You will of course get alerted as well if Friend View is in use in foreground. Depending on where you live or travel, on your schedule and mood, you can adjust the Friend alerts’ meeting zone (options: More: Settings – Friend Alerts & Meeting zone) to define how close your friends should be to get alerted. Mobile client: Tested with Nokia 5320 XpressMusic, 6110 Navigator, 6210 Navigator, N95, N95 8GB, N82, N96, E71, E90, N80 and E61. Should work on all Nokia devices based on S60 3rd Edition. Web interface: The browser interface has been tested with Firefox, Safari, and Internet Explorer 7. Try it at friendview.nokia.com. I recently stumbled upon a cool promo video for the Nokia 6710 showing off it’s navigator capabilities with built-in aGPS and maps. It’s about this guy who found a phone on the bench in a park and he used the maps and ‘places’ feature to lead him to the owner of the phone. Check it out! GoogleMap Landmarks on S60. Saving and Transferring. I then found out that it is actually possible. As usual, we can save any locations on the map as favourite by tapping and holding the spot on the map > Save as favourite. Once saved, the details of the location will appear in the favourites list. Unfortunately, you cannot send the ‘favourite’ locations out as there is no options for that in Google Maps, but you can do it in ‘Location’, a feature that comes with most new Nseries and 5800. In Location, select landmarks. Then all the locations that you have saved as favourites in Google Maps will appear here. Select a landmark, click on options, and you can choose to send it out via message(MMS) or bluetooth. Google has just launched it’s latest version of the Maps application for mobile with a new feature, Google Latitude. It’s a way of finding your friends along with their location and status(yes you can update your status just like Twitter) on the map. The new feature is actually not so new as we have already seen similar services before this like Buddycloud and Nokia Friendview but this might be a more successful version because any phone that supports Google Maps can use it… so it’s not limited to Nokia phones only. Watch the video introduction to know more on Latitude. Here are a few screenshots I took of the new GMaps on my 5800 XPM. One very important thing is privacy. We have the option to choose whether our locations are set automatically, manually or off/hide. When you have added friends, you will get to see them in a list along with their details. Click on “See Map” and you can see your friends on the map represented by pins with their photos on it. Clicking them will reveal their statuses, addresses and the option to get directions to them. Nokia Beta Labs has recently released the beta version of Friend View. A location and micro-blogging service that helps you stay in touch with your friends and family so you can update one another with what you are doing and where you are doing it. Here’s a video to show you how it works. This is how it looks like on the my phone. Just installed it a few minutes ago. You can view your friends’ updates via map view or list view under the “What’s Up” List. If you feel like updating it via web, you can too! Quick! Download the app and start updating your status on Friend View! FriendView is currently compatible with Nokia 5320 XpressMusic, 6110 Navigator, 6210 Navigator, N95, N95 8GB, N82, N96, E71, E90, N80 and E61. Should work on all Nokia devices based on S60 3rd Edition. This is my 5th post on Nokia 5800. So when I got to preview it, I told myself… not to forget to try the browser and maps! … but in the end I did try both but I didnt take photos and videos of the browser. Anyways, I did try the maps for a while though. It was actually kinda slow when opening Nokia Maps… probably cos they still haven’t refine it in the prototype firmware. Basically it’s the same Nokia Maps and interface as the one on current Nseries models. Same menu, same search bar, same zoon and unzoom buttons. I’ve only tried the map view. Left out the satellite view. To move around the map, we only need to use our finger to touch and drag the map around. Touch the ‘+’ sign to zoom in and the ‘-’ sign to zoom out. Moving around the map was super slow. As well as zooming. Really hope this will be fixed in newer firmwares. Prefer to watch it on Youtube? Click here. 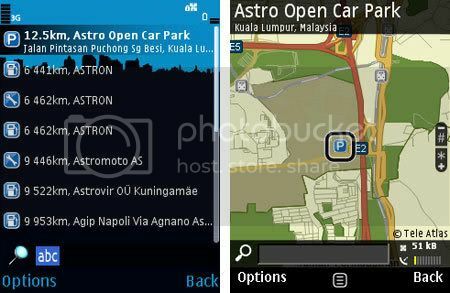 Nokia recently announced “Maps on OVI” and it’s a web component that you can use side by side with the new Nokia Maps 2.0. Users can now plan routes on the PC and sync it with Nokia Maps 2.0 on the phone before going out. One can also save landmarks, record routes etc and sync i back to the PC when they are home. 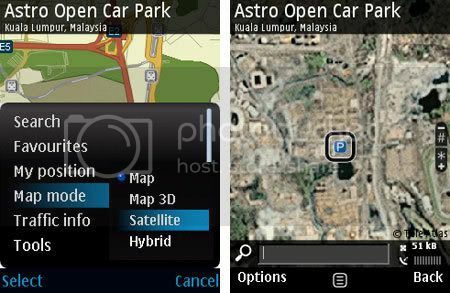 Nokia Beta Labs has released a new version of the Maps 2.0 beta. For u guys whom are still not aware, this new version has satelite view! just like google maps… and a lot more lil features added.. The new beta is definitely faster at startup and more stable. 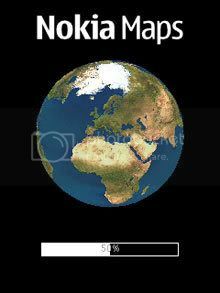 As we all already know, the Nokia Maps 2.0 beta is out but not officially open for download yet. - sends out geotag to friends instead of normal addresses in SMS. Here’s some screenshot of me trying out the application. The search box is always at the bottom of the screen for easy access. I searched for Astro and the list of all things Astro appears. I then select the one I was looking for and its then shown on the map. there’s more features yet to be explored.